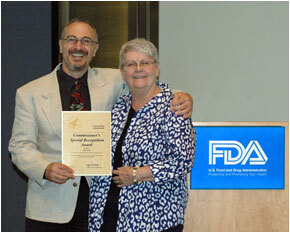 Our President, Peg Ford received the Food and Drug Administration (FDA) Commissioner’s Special Recognition Award as a member of the 2014 Patient Representative Workshop Team “For successfully conducting the highly valuable and effective 2014 FDA Patient Representative Training Workshop” Peg was presented with the Award when she participated in the FDA Ovarian Cancer Endpoints Workshop on September 3, 2015. Peg Ford, OCA of San Diego President, was recently featured in The San Diego Union-Tribune. Click on the San Diego Union-Tribune logo for online version of the article. 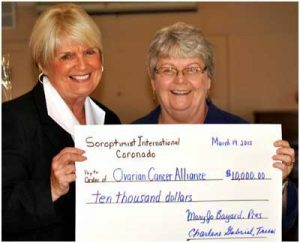 Ovarian Cancer Alliance of San Diego was delighted to be awarded the Soroptimist International of Coronado (SIC) (www.coronadosoroptimist.org) 2015 Best for Women Grant to expand their community outreach program to civic groups and organizations! Soroptimist International of Coronado’s mission and target areas of concern are to support organizations who have a significant impact on the lives of women and girls either who are affected by domestic violence or human trafficking, and/or organizations who are working to improve access to education and health services for women and girls. 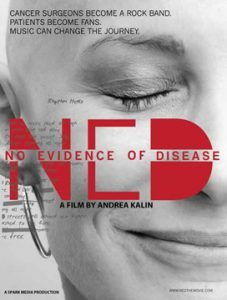 Regal Cinemas presented exclusive screening of the award-winning documentary No Evidence of Disease on World Cancer Day, Wednesday, February 4th, 2015. Below the belt cancers, a band of GYN Oncologists and rock ‘n’ roll came together in this film. Ovarian Cancer Alliance of San Diego hosted the documentary in San Diego where following the film, there was an on-site post-screening discussion.